Last season, the AFC West was a smorgasbord of mediocrity. The Denver Broncos won the division with just eight wins and with a quarterback that completed less than 50% of his passes. John Elway couldn't stand winning that way, so he jettisoned Tim Tebow and signed one of the greatest quarterbacks to ever play the game, Peyton Manning. Despite being out of the game for a year with a neck injury, expectations are that Manning can lead the Broncos to a Super Bowl. The San Diego Chargers are looking to get back to the playoffs after a two year absence and for whatever reason think Norv Turner is still the right coach for the team. The Kansas City Chiefs are now led by Romeo Crennel, who did an admirable job filling in as interim coach last season. They were a team decimated by injuries last year, so they are hoping the pendulum of health will swing back to the right side this season. The Oakland Raiders were in the playoff hunt until the final week, but that didn't stop them from once again making a coaching change. They are hoping a full season of Carson Palmer at quarterback is the recipe to getting back in the playoffs for the first time in a decade. 2012 Outlook: Denver had one of the strangest, most unique seasons in NFL history. It got off to a terrible start with Kyle Orton as their quarterback and the fans were shouting more and more for Tim Tebow. John Fox finally acquiesced and the Broncos seemed like they couldn't lose, winning seven of their next eight games with Tebow at quarterback. Tebowmania was running wild but then it seemed to die as the Broncos lost their final three games. Fortunately for them, no one else wanted to win the AFC West so they backed into the playoffs. People expected the Broncos to get destroyed by Pittsburgh and it looked that way for about three quarters, but then Tebow magic took over, as he brought the Broncos back to win in overtime. The season ended in embarrassing fashion as they were killed by the Patriots. 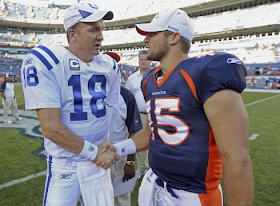 John Elway could have kept coasting on Tebowmania but when Peyton Manning came available he decided he needed to make a bold move. Elway signed Manning, then the next day traded Tebow to the Jets and changed the direction of the franchise. Manning missed all of last season after various neck surgeries but insists he is ready for the rigors of a 16 game season. Manning at 50% is a dramatic improvement over Tebow at quarterback so it was definitely a move they had to make. They have to hope Manning stays healthy because his backup is former Bears quarterback Caleb Hanie, who basically killed the Bears season when he had to replace Jay Cutler. The Broncos were the number one rushing team in football last season due partially to the shocking resurgence of Willis McGahee. McGahee looked finished in Baltimore but had an excellent season last year. It will be interesting to see if that was his one last burst of glory or if it something he can sustain. Knowshon Moreno is still around but has become a forgotten man. The Broncos don't have anyone at wide receiver that scares anybody and are mostly counting on Manning to make the group better. Eric Decker and Demaryius Thomas showed flashes last year and could be in for breakout seasons. Brandon Stokley, an old Manning favorite, was added to the team, but it isn't clear how much he has left in the tank. Another player Manning is familiar with, TE Jacob Tamme was brought in to share tight end duties with Joel Dreesen. Manning is fortunate to be protected by a good offensive line. Tebow was known for holding the ball way too long and he usually got tons of time to throw. The Broncos defense was up and down last season. When the team was winning they played pretty well but they were prone to games where they were absolutely torched. They brought in Tracy Porter, former Super Bowl hero of the Saints, to try to improve their pass coverage. They have some real talented players in LB Von Miller, and DE Elvis Dumervil so the pieces are there to build a dominant defense. The Broncos have one of the better special teams units in the league with a reliable kicker in Matt Prater, and an excellent punter with Britton Colquitt. However, they will miss having Eddie Royal in the return game. The schedule is not easy but this is a team that squeaked out 8 wins with Tebow at quarterback, I think if they get a healthy Manning 10 wins and a division title are certainly doable. 2012 Outlook: Last season, San Diego flipped the script a bit and got off to a fast start, then the bottom fell out as they lost six straight, and it was too little too late for them as they closed out the year with wins in four of their last five games. Rather than blowup the front office, they decided to give GM AJ Smith and coach Norv Turner another chance to try to get the Chargers back to the playoffs. Turner has to be the luckiest coach in NFL history. No other coach has been allowed to fail as much as he has and stuck around for so long, first in Washington and now in San Diego. QB Philip Rivers struggled through a mostly terrible year last season. He didn't get much help from his offensive line, and he was constantly on the run which helped lead to many of his interceptions. The Chargers got some bad news last night when RB Ryan Mathews was hurt on the first play from scrimmage in the preseason and will now miss 4-6 weeks. That means it will be up to free agent acquisition Ronnie Brown to take over, since Mike Tolbert left for Carolina in the off-season. Brown did nothing in Philadelphia last year, but he wasn't given much to do and I feel he has more left in the tank than people think. Vincent Jackson left for Tampa Bay so now it is up to Michael Floyd, and new signings Eddie Royal and Robert Meachem to carry the load at receiver. Rivers numbers were also hurt last year because his best target, TE Antonio Gates battled injuries all season. This has been a recurring theme for Gates the last few years and is a definite concern for the Chargers. The Chargers were a middle of the pack team on defense, after being one of the stronger defensive teams in 2010. The Chargers hoped they addressed their problems getting to the quarterback by drafting Melvin Ingram in the first round. They might have also made the horrible mistake of keeping LB Takeo Spikes on their team. Spikes has never made the playoffs in his entire career. Nate Keading and Nick Novak are battling for the kicker job, while strong Mike Scifres is back as punter. The Chargers have a manageable schedule and could get off to a fast start. Brown will have to be effective while replacing Matthews and Rivers will have to develop a chemistry with his new options at wide receiver. I never feel confident picking a Norv Turner led team to have success but I think the Chargers can win 10 games this year and be in position to make the playoffs. 2012 Outlook: I predicted a fall for the Chiefs after they won the AFC West in 2010 and I proved prophetic. They opened the season with losses of 41-7, and 48-3 and saw their coach Todd Haley get fired mid-season. Thanks to the mediocrity of the AFC West they were in a battle for the division until late in the season but ultimately finished 7-9 and missed the playoffs. They were a team decimated by injuries. TE Tony Moeaki was hurt in the preseason and didn't play a down in the regular season. Star RB Jamaal Charles got hurt in the second game of the season and missed the rest of the year, and defensive start Eric Berry got hurt in Week 1 and missed the season. QB Matt Cassel also was injured early in the year and missed most of the season. After a strong 2010 he struggled mightily when he did play in 2011 and Chiefs fans are losing patience with him. Brady Quinn is his backup so Chiefs fans better hope that Cassell regains his 2010 form. If the parts around him can stay healthy there is no reason he shouldn't be able to. Charles is an electrifying back but it is hard coming back from such a serious injury as an ACL tear. With that in mind the Chiefs brought in Peyton Hillis to provide some support. Hillis fell victim to the Madden Curse in 2011 and the curse of being a Cleveland Brown, but should be a more than capable backup. Their best wide receiver, Dwayne Bowe is still a hold-out and there is no telling when he might show up. They better hope he shows up soon because the receiving corps is pretty crappy outside of him, with marginal Steve Breaston and the unproven Jon Baldwin. Moeaki is back at tight end this year and showed signs of great potential in 2010. The Chiefs have a strong offensive line and Cassel should have time to throw and find open guys. The Chiefs were horrific against the run last season but even without Berry were still one of the better pass defenses in the league. That might have also been because teams knew they could run on the Chiefs all day and not even worry about trying to pass. With that in mind the Chiefs selected NT Dontari Poe in the first round. The return of Berry will make it even harder for team to pass on the Chiefs, and coach Romeo Crennel typically has a pretty strong defense. Kicker Ryan Succup and punter Dustin Colquitt are serviceable. The Chiefs should be helped by the many returning stars but Cassel is a huge question mark, as is head coach Crennel. Crennel's credentials as a coordinator have never been questioned but his ability to lead a whole team hasn't shown great results in the past. I think the Chiefs won't have the bouts of lack of competitiveness like they did last season but aren't quite a playoff team. 2012 Outlook: 2011 was a typical season of instability for the Raiders, some of which was in their control, some not in their control. Longtime owner Al Davis passed away during the season, jump starting a new era in Oakland. The Raiders then made a ridiculous trade for QB Carson Palmer after their previous starter Jason Campbell went down with an injury. Palmer struggled and the Raiders struggled with him losing six of their last ten games, and once again missing out on the playoffs. They brought in a new GM, Reggie McKenzie, who promptly fired Hue Jackson and brought in Broncos defensive coordinator Dennis Allen as his new coach. The Raiders have had so many new coaches in the last ten years I have lost count. The Raiders felt they needed a defensive coach as the defense was atrocious last year in every possible way. Palmer will have a full year of training camp and preseason this year so it stands to reason he will be more sharp than he when he came in off the couch last year. However, even sharp Palmer in recent years hasn't been all that special. They lost RB Michael Bush to free agency, and will now have to hope that Darren McFadden can actually stay healthy an entire season. McFadden is one of the best backs in the league when he plays but the problem is he is too often not playing. Darius Heyward-Bey began to show promise at wide receiver last year, while Denarius Moore had a strong rookie campaign. Kevin Boss left, and the Raiders have a bunch of nobodies at tight end this season. The offensive line remained mostly intact and was one of the stronger units in the NFL. For the Raiders to have any sort of success this year Allen is going to have to get the defense on track. They have lost quite a few pieces the last few years and it is starting to show. Their strongest players, Kamerion Wimbley and Stanford Routt are both gone, so things may get worse before they get better. They may have the best kicker/punter combo in the league with the booming legs of kicker Sebastian Janikowski and punter Shane Lechler. After back to back 8-8 seasons I feel the Raiders should have finally kept some stability at the head coach position. They are changing things once again and that is the main reason they haven't been to the playoffs since 2002. I think the defense will get worse and not better, and I don't expect McFadden to make it through the season healthy. It will be an ugly year in Oakland. utilizing? I'm experiencing some minor security issues with my latest site and I would like to find something more safeguarded. A lot of thanks for all your hard work on this web site. supply me a lot of fodder for thought. got here to “return the desire”.I am trying to to find things to improve my site! you will show up impressive. There are diverse varieties of hues and measurements of the nike air max sneakers. Google strategy that don't rank this type of informative websites in top of the list. It's remarkable to visit this website and reading the views of all friends concerning this article, while I am also eager of getting knowledge. for those who browse through your blog post. Of course, what a great website and instructive posts, I surely will bookmark your blog. What’s Happening i'm new to this, I stumbled upon this I've found It absolutely helpful and it has aided me out loads. I've read this post and if I could I wish to suggest you few interesting things or tips. Maybe you could write next articles referring to this article. I wish to read even more things about it! Greetings from Los angeles! I'm bored to death at work so I decided to check out your website on my iphone during lunch break. I enjoy the information you provide here and can't wait to take a look when I get home. not even using WIFI, just 3G .. Anyways, awesome blog! article is in fact fastidious, every one be able to effortlessly understand it, Thanks a lot. I'm inspired! Very helpful information particularly the last section :) I care for such information a lot. I was looking for this certain info for a very lengthy time. Thanks and good luck. Hi! This post couldn't be written any better! Reading through this post reminds me of my good old room mate! He always kept talking about this. I will forward this post to him. Pretty sure he will have a good read. Thanks for sharing!